At the University of Miami Miller School of Medicine, diversity is not just a goal, it’s essential to the business of health care. Having doctors, nurses, students, and staff who reflect the communities they serve is important for the institution and its patients. 2019 participants in the Miller School of Medicine’s Students Training in Research (STIR), a summer research program for underrepresented students who display interest in laboratory research and academic promise in the sciences. 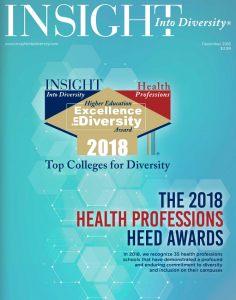 Thanks to its comprehensive diversity and inclusion efforts, the Miller School was just named a winner of Insight Into Diversity’s Health Professions Higher Education Excellence in Diversity (HEED) Award. The HEED Award and the Health Professions HEED Award are the only national awards that honor individual institutions for being outstanding examples of colleges, universities, or health profession schools that are committed to making diversity and inclusion a top priority across their campuses and are helping to develop innovators and leaders for today’s global workforce. The Miller School is one of only 35 schools natio nwide, and three in Florida, to receive the HEED Award. Its commitment to diversity is evidenced by the fact that it has an Office of Diversity and Inclusion, led by Stephen Symes, M.D., FACP, associate dean for diversity and inclusion, and Nanette Vega, who has served as its executive director since it was established in 2014. “Diversity and inclusion initiatives have been important to UM for many decades and have helped the Miller School better reflect and serve the diverse South Florida community,” Dr. Symes said. Vega, who herself was previously recognized by Insight Into Diversity with a Diversity Visionary Award for her “vision, dedication, and long-term commitment to diversity and inclusion,” said her team focuses on providing professional development and pathway programs for high school and college students interested in exploring careers in medicine. Vega added that the Miller School aims to be a national leader in the diversity and inclusion of its workforce. “It’s really rewarding to see the Miller School recognized for its commitment and its achievements,” she said.